Mountaintop removal coal mining is changing the American landscape on a scale that is hard to comprehend unless you see it from the air. Anyone who has ever flown in a small aircraft over southern West Virginia or eastern Kentucky will never forget the experience of seeing the massive scale of destruction – mountain after mountain blown up and dumped into valleys as far as the eye can see. Appalachian people working to save their communities long dreamed of a way to fly reporters, decision-makers, and thousands of Americans over the Appalachian coalfields to see this destruction first hand. The collection of mapping resources below are our best attempts to approximate that tour. Whether you’re a GIS professional or are just learning to use Google Earth, you’ll surely find these maps and data useful. If you have resources to share, please email us. Shape files, Google Earth files, data tables, and more. The most current extent map available. Includes mine boundaries, sludge impoundments, and processing plant locations. Interactive tour in Google Earth. 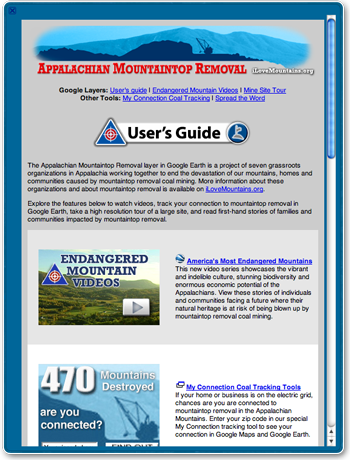 If you already have Google Earth on your computer, you can view the Appalachian Mountaintop Removal Layer without downloading anything. The layer includes a high resolution mine site tour, the National Memorial for the Mountains, before and after image overlays of mines, mine-site overlays on 36 U.S. cities, a 3-D model of a dragline, and more. Once you have Google Earth open on your computer, open the “Global Awareness” folder in the “Layers” menu at the bottom left portion of your screen. Clicking on “User’s Guide” will help you make the most of your visit. For most people, its hard to understand how big 10,000 acres really is. So, we superimposed the Hobet mountaintop removal complex in Boone County, WV on 36 of the largest cities in the United States. As shown on the right, Hobet is as big as Manhattan Island in New York City. You can explore the city overlays in three ways: still images, videos, or directly in Google Earth.